Largest Heavy Duty Side Dump. 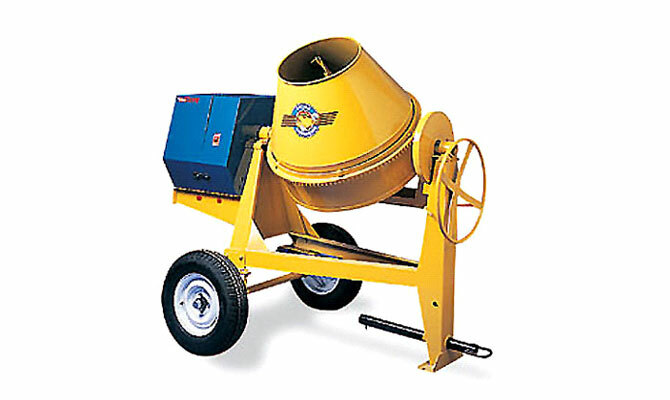 For those jobs that require maximum mixing capacity and high performance. Built to handle heavy loads with an unheard of 1/2 yard capacity. Complete with B78 x 13 (25" dia.) high speed tires, tapered roller bearings, 56" wide axle with cantilever springs, 2-3/8" O.D., 7/32" thick towpole with safety chain, pintle style hitch, 24" dia. handwheel, oversized paddles, chain drive and dump lock, spacious cowl for maximum ventilation. Big 40" diameter thick steel drum. For those jobs that require maximum mixing capacity and high performance. Complete with B78 x 13 (25" dia.) high speed tires, tapered roller bearings, 56" wide axle with cantilever springs, 2-3/8" O.D. 7/32" thick towpole with safety chain, pintle style hitch, 24" dia. handwheel, oversized paddles, chain drive and dump lock, spacious cowl for maximum ventilation. Drum Size 12 cu. ft.